Before I saw the mugger’s knife, I noticed his shirt: a roll-your-own-logo tee, the kind you’d order online as a gift with a relative’s favorite hokey catchphrase. Official Olympic Beer Drinking Team. Duct Tape Ph.D. I’m With Stupid. That kind of shirt. An English catchphrase on the shirt, even though he mugged me in Guatemala City. Something senseless, something about cigarettes. Maybe he’d worn it on purpose. You want to roll tourists, you can wear a weird shirt, lure in their eyeballs until they’re too close to get away. It was early afternoon on May 4, already too hot for me. I was sweaty, tired, had just tramped north on 7A Avenida from the archaeology museum, hoped only to get around the big Boulevar Liberación traffic interchange to continue east to my hotel. 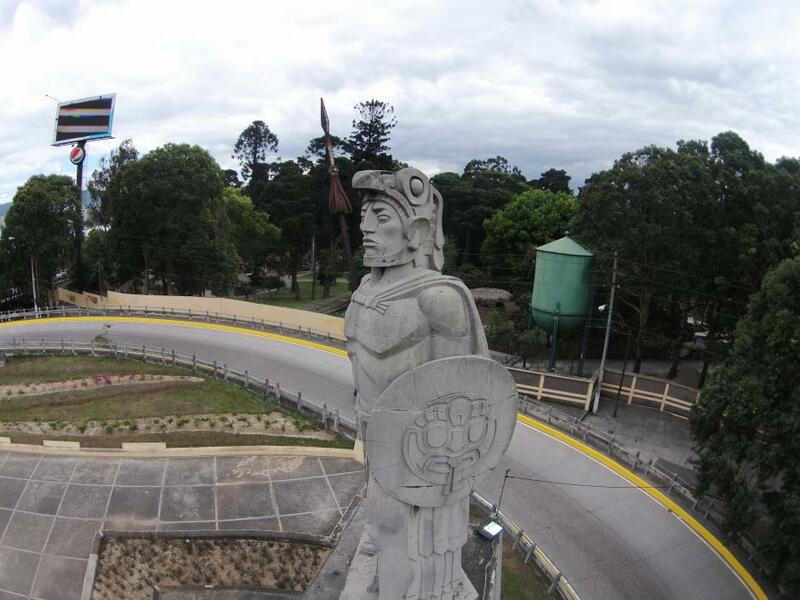 My smartphone map had shown me a pedestrian walkway behind the Tecún Umán monument. I’d taken the walkway on the way to the museum, had noted — uncomfortably, more presciently than I knew — that a forty meter stretch under the eucalyptus trees was isolated from traffic. But how else was I going to get around that big interchange? And this part of Guatemala City was supposed to be safe. Wasn’t it? An online photo shows where it happened. See the beige fence behind the monument? Where it dips into the eucalyptus trees on the left? That’s where he got me. I think I’d just passed the last beige fence section in the photo when I saw him, a crew-cut, thickset twenty-something, hiking up the walkway toward me. With that shirt. I remember trying to stare at it without being obvious, wondering what it meant and why anyone would want to print that ridiculous sentence about cigarettes. Then he pulled the knife. A fixed-blade knife, like a bowie, but with a shorter blade. Maybe four inches. The police report said he threatened to kill me. That part wasn’t right. He didn’t have to. I knew why he had it. I sized up my options. They weren’t good. I could turn, run, try to get back to traffic and eyewitnesses on 7A Avenida. They were a long way back now. Retirees rarely outrun twenty somethings. I could resist. He had the knife and at least thirty years on me. He held the knife at shoulder height to get me to look at it. He stepped closer. Guatemala exists, functions, abides; simultaneously, it crumbles, collapses, caves in on itself. Its people industriously erect new girders on the national superstructure, even as the beams of stories below crack, rupture, collapse. The country reminded me of a former D.A. I once knew who worked in sales while recovering from a nervous breakdown. To meet the man was to see both the D.A. and the breakdown: an orator’s stage presence accompanied by twitches, trembling. Corruption infests all levels of Guatemala’s government, a charity worker told me; she gestured at storefronts as we rode through the outskirts of Antigua, opined that most proprietors pay rent to gangs. The gangs also prey on the operators of the public transit “chicken buses,” at least in Guatemala City. Two long-timers in country had warned me away from these buses (which is why the mugger caught me on foot). Some rode safely for years, they said, but gangs had gunned down drivers, held up riders at gunpoint. How does one travel in the capital, if fearful of walking or using public transit? One may drive. Or ride cabs, or Uber. Before my mugging, I had tramped wearily past endless homely Guatemala City blocks gridlocked with rumbling, smoking, honking cars, cars, cars: cars like fortresses, with windshields and side windows tinted dark, nearly black, foiling the view of a potential thief or gun man. “If you live in Guatemala,” a businessman would tell me, on the plane ride back to Madrid, “you learn how to stay safe.” I had enjoyed a few blocks of Zone 10’s Zona Viva and the park-like campus around Museo Popol Vuh, but otherwise judged the city to be as cute as an abscess, largely thanks to the traffic. “Child labor is a fact of life in Guatemala,” guides will say, to steel visitors for what they will see and not change. As a Los Angeles school teacher, I chose seven year olds as crayon monitors, listened to their giddy hopes for visits from Santa. In Guatemala, I saw children that young pace between fuming exhausts on gridlocked traffic lanes, selling lottery tickets, fruit, candy. Working. Twenty-three percent of Guatemalans live in extreme poverty; almost half the population is under nineteen. Why do natives risk life and limb to emigrate to the U.S.? Visit. You’ll see. Guatemala still offers sights worth seeing, its malignant infrastructure notwithstanding. The waters in the shot above belong to Lake Atitlán: a half-day drive from Guatemala City, spectacular, described as safe. It too is in the process of collapsing, thanks to serious, inadequately addressed pollution issues, but I judged the pollution to be largely invisible to sightseers. I smelled no untoward odors, saw no floating debris. Picturesque hamlets dot the shores of the volcano-ringed lake, and a tourist can comfortably visit most in a single day via a boat ferry. 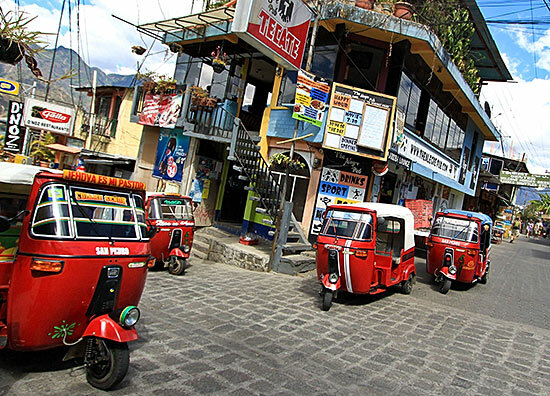 Three-wheeled tuk-tuks noisily ply the narrow roads, bussing riders for a few quetzales. Camera-toting Europeans stroll alongside young Guatemaltecas in bright Mayan dress. Each shoreside town offers a different vibe. Little San Juan struck me as the prettiest. I stayed in Panajachel, dubbed “Gringotenango” for its population of pale-faced tourists. San Marcos could have been transported by time machine from a sixties hippy commune; a visiting baby boomer may wax nostalgic here over a carob-fruit smoothie, under a cafe bulletin board advertising yoga classes, crystal healing. Hours closer to Guatemala City is another tourist hub: Antigua, a centuries-old capital of Spain’s empire in the Americas. Antigua is flat, cobblestoned, home to the eighteenth century Convento Santa Clara, the Templo Santa Teresa de Jesus, Cerro de la Cruz, a charming Plaza Mayor. In Atitlán, I mostly met tourists visiting from the Old World; in Antigua, I met more Americans, perhaps coincidentally, perhaps because I took a Bay Area expat’s (excellent) tip to dine at vegetarian Samsara. Cuisine that appeals to one Yankee may appeal to others. Some Guatemala visitors hop aboard short, cheap Avianca or Tag shuttle flights from Guatemala City to Flores, then ride north to admire the ruins of ancient Tikal. Others are partial to Livingston and the Rio Dulce. Visit either and you’ll know more than I do: I saw only the capital, Antigua, Atitlán and the roads between. You could go! Avoid Guatemala City, book private transport from the airport to Atitlán, Antigua or whatever site you decide to visit first. Approach ATMs with care, and read up on their use first on online Guatemala travel forums. The European tourists seemed happy to be vacationing in Guatemala, although a few griped about their hotel accommodations. I met no other crime victims. The mugger got my smartphone first, accepted it with his left hand as his right held the knife close to my midsection. Then he wanted something else, and despite my shock and fear I managed to register a moment of fleeting, bitter irony. “Los paños!” he had just demanded. Paño meant cloth; what was he talking about?! I goggled at him helplessly. For almost two years I had battled daily with español as an expat in Madrid. How horribly fitting that my inadequate Spanish might now get me knifed. “Los paños!” he insisted again, but must have judged my incomprehension as sincere, and changed tack. He seemed to be in a morbidly cheerful mood. Did my bewilderment amuse him? Or was he pleased to have stumbled into a likely crime of opportunity, to have bagged an elderly tourist? “Tu dinero!” he demanded. I pulled out my wallet. “Todo, todo!” I opened the billfold, grabbed all the quetzales, handed them over. And then it ended. He said something stern about staying put, walked off. Dazedly, so did I. I felt as I might have felt if spattered with mud from a passing truck while en route to a wedding in a tuxedo. Something bad had happened, something unexpected; I couldn’t travel back in time to make it right; I had to adjust. Could I find my hotel without my smartphone? I reached Calle Montúfar, squinted uncertainly east toward the distant skyscrapers of Zone 10. At least he’d mugged me close to the hotel. If I could just find the plaza; that would be close enough; I’d recognize buildings. I settled into the hike, flanked again by lanes of the city’s interminable traffic, as hot and sweaty as I’d felt before the mugging, and now dazed, too. Instinctively I reached for my smartphone to check the mapping app, had to remind myself why the pocket was empty. My childhood trips to San Francisco’s Playland-at-the-Beach amusement park almost always included a go on the Devil’s Wheel: a circular platform, perhaps seven meters wide, surrounded by bumper cushions. A dozen kids might rush onto the platform at the start of a turn; we picked our spots on the polished wood, braced our little fingers. The wheel began to rotate, picked up speed, spun faster, faster; we squealed as it spun us into the bumpers. Sometimes only a single victor remained sitting at the end of the turn; often, there were none. My trip to Guatemala reminded me of that wheel. No challenge seems to more frustrate humankind than good government. Study some health metrics — from Transparency International, Reporters Without Borders, the Economist Democracy Index and the OECD — and you may conclude that only a handful of countries have achieved anything like it: Scandinavian countries especially, Switzerland, New Zealand, a few others. The rest flounder for a grip on various spots on the wheel. If they are as close to the edge as Guatemala, life conspires constantly to make matters worse. Scores of online travel forum threads report ATM fraud in Guatemala; some suggest darkly that bank insiders have played a role. Experts describe organized crime networks within branches of Guatemalan government. Consider the implications. Any society needs and should produce citizens who are honest, bright and stable enough to make core institutions function: utilities, banks, hospitals, providers-of-essentials, government itself. What happens when individuals in this rank take a shaft-or-be-shafted attitude: grab the bribe now, get rich while the dirty money is available, let society take care of itself? “Nothing good,” is the answer, and the crumbling invites more of the same. Leaders can’t demand a clean slate, have to play with the chips left over by administrations, decrees, lucky and unlucky breaks past. Guatemala can’t call Deliveroo for a cheerier twentieth century CV (hold the CIA coup, the Rios Montt dictatorship) or a sunnier set of vital stats. The Guatemala City cops wore powder blue uniform polo shirts. They sat across the table from the hotel security chief and me, two athletic twenty-somethings, asked polite questions. When had it happened? Where? What did he steal? Going through the motions, I thought. Where did I think I’d been mugged, exactly? Oslo? Zurich? What miracles did I expect them to perform for a tourist leaving the country in a day in a city where gangs gunned down bus drivers? But: I was entitled to make the report, and perhaps too they felt privately grateful to sit for awhile in a quiet, ritzy, air-conditioned hotel conference room, away from the heat and scorching sun. They asked more questions, took notes. I thanked them, returned to my room. I stared dourly out at the city skyline from the picture window and tried to size up where I stood, a mugging victim in the computer age. I hadn’t lost much. I had left my dSLR in Madrid, thanks to Guatemala’s crime rep, had also safely stored passport and some vital ID and bank cards before venturing outdoors that morning. The six hundred stolen quetzales came to under seventy euros. The cellular sim card was a prepaid from Guatemala telecom Claro, picked up at an airport kiosk. I would have chucked it on the plane anyway. The main loss was the smartphone. One of the cops had asked about Android Device Manager. I’d answered simply that I didn’t have it, rather than tell the long story about the switch to F-Droid, why I’d rather lose a phone than be tracked worldwide. But now I had to accept the downside: I couldn’t use Device Manager to erase the phone from afar. Any personal data in /sdcard was in the wild. Still not much. I regard smartphones warily, avoid them for log-ins, email, banking, shopping. But I’d copied .pdfs of my passport and Spanish ID onto /sdcard. In the wild now. Then I remembered a .pdf’d itinerary on /sdcard, with emergency contact information for a relative and a friend. Would a crook contact them with an “Urgent-I’m-in-the-hospital-please-wire-$10,000” scam? Better be safe. I rode the elevator to the hotel lounge, asked to use a computer, logged into a junk e-mail account to send heads’ up messages to the friend and relative in question. A lounge host lingered solicitously. Could he get me anything to drink? We chatted. He was about thirty, regally dressed in a starched white tunic, fit for Buckingham Palace. We started in Spanish, but his English turned out to be excellent, as good as I’d heard at the hotel. “You must have lived abroad.” He smiled self-consciously; yes, he had; eight childhood years in New England with his family. I thought of asking about the return to Guatemala, checked myself. Perhaps a sore point. Too personal. He asked politely about Madrid. I spoke enthusiastically of my adopted home, described some of the hurdles of the visa application process. I offered details, too many. He must have realized that I assumed that he wanted to get out of Guatemala. He blinked, flustered, looked at me in confusion. In Madrid, I showed the Guatemala police report to a few regulars at the intercambio I host at the VIPs Velázquez — our home restaurant now, cool, plush, soft lit, tucked under the Calle Velázquez oaks in the El Viso ward, one of the city’s toniest. Some clucked sympathetically. No one was surprised. “Isn’t the crime like that in all the Latin American countries?” one Spaniard wondered sadly. Look at Venezuela. Horrible problems. Of course, people wanted to leave. Why, half the waiters in central Madrid now had to be from Caracas! Twenty years ago they’d all come from Buenos Aires. Had I heard of the corralito in Argentina? The bank run? No, nothing that bad now in Spain. I shouldn’t misunderstand, the financial crisis had been terrible, terrible … but no, nothing like that. And Madrid was a relatively safe city. Not all parts, not the Cañada Real, but who went there? Drug users. The chat moved to other matters, the usual intercambio fare: summer heat in Córdoba (46 Celsius sometimes! ), dealing with accents (Andalusia, the Canaries, the American South), what was my candid personal opinion as a native English speaker of the Vaughan Method? Be blunt! (No idea; sorry.) The meeting ended. Participants drifted off. I set out on my usual shortcut to the Gregorio Marañón metro station, in no hurry (The trains ran every four minutes. ), listening to a Spanish radio interview through ear buds as I strolled through the lengthening shadows of early evening in spring. I felt fortunate. 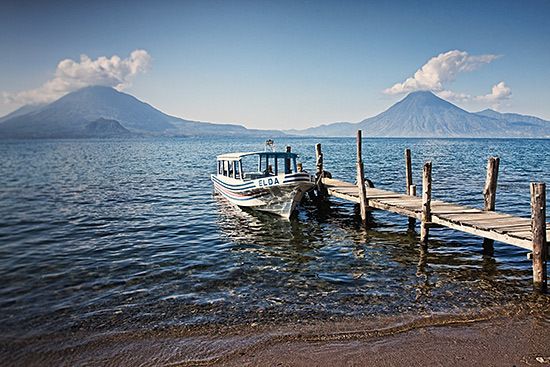 This entry was posted in Travel and tagged Guatemala, travel. Bookmark the permalink. Post a comment or leave a trackback: Trackback URL. This article is a joke. I’ve been to Guatemala multiple times as a 25 year old male from Austria. You shouldn’t have been in the city in the first place and that is well advertised in smart travel websites published by governments. People like you damage the reputation of other places such as Antigua and The Lake.